Reflecting the strong aesthetic turn in literary studies, these powerful, persuasive essays keep an eye on the seductions of beauty while offering fresh approaches to medieval poetics. Significant new scholarship, they open out to a wide range of medieval poems and poetical features, as well as to the aesthetic preoccupations of nineteenth-century medievalism. 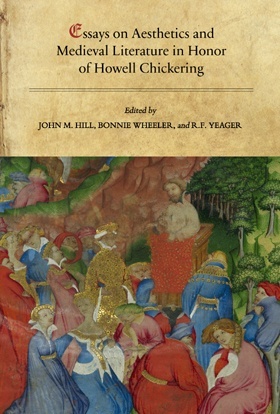 The contributors honor Howell Chickering's multi-faceted work on poetic energy, metrical surprise, and the sonic features of sense by, collectively, moving insightfully across early medieval fragments, such as “Caedmon's Hymn” and The Battle of Maldon, to the art of depicting psychological states in Old English narrative, the sublime aesthetics of terror in Beowulf, and pitch as well as deep and surface proportioning in The Dream of the Rood. For Chaucer's Age, well-researched contributions assess modes of beauty in Troilus and Criseyde, surprising unity in Chaucer on women and love, the aesthetic implications of grammatical choices and forms, and the celebration of art in Gower's French balades. Good fun is had with the artful humor of insatiable wives in the Canterbury Tales, along with the practical and gustatory aesthetic of Lydgate's culinary poems. The focus on medieval poetry rounds out with thoughtful essays on mystical poetry and prose and on the challenges of translating ambiguity in Sir Gawain and the Green Knight. The gathering closes, however, in intellectually and artistically striking ways with essays on Coleridge and medievalism, and, finally, the page design, ornamentation and typeface beauties of the Kelmscott Chaucer. Pleasure and delight abound in a most fitting tribute to the broad impact of the career of Howell Chickering, the G. Armour Craig Professor of Language and Literature at Amherst College. John M. Hill teaches Anglo-Saxon literature and fourteenth-century English poetry at the U.S. Naval Academy. He is the author of Chaucerian Belief (1991), The Cultural World in Beowulf (1995), The Anglo-Saxon Warrior Ethic (2000), and The Narrative Pulse of Beowulf (2008). He has also edited Reconstructive Polyphony: Studies in the Rhetorical Poetics of the Middle Ages, with Deborah Sinnreich-Levi (2000), On the Aesthetics of Beowulf and other Old English Poems (2010), and special issues of The Heroic Age and Philological Quarterly. Bonnie Wheeler is Director of the Medieval Studies Program and Associate Professor of English at Southern Methodist University. She has edited, co-edited, and co-written thirteen books, most recently The Letters of Heloise and Abelard: A Translation of their Collected Correspondence and Related Writings (2009). She serves on the Executive Board of TEAMS, the Committee on Teaching the Middle Ages, which she founded. She is also founding editor of Arthuriana, and editor of peer-reviewed book series for Palgrave Macmillan including The New Middle Ages and Arthurian and Courtly Cultures. R.F. Yeager is Professor of English and Foreign Languages at the University of West Florida. He is editor of JGN: The John Gower Newsletter, and has published widely on medieval English and European literatures. He has edited and translated John Gower: The Minor Latin Works (2005) and a companion volume, John Gower: The French Balades (2011); with Brian W. Gastle, he has co-edited Approaches to Teaching John Gower's Poetry (2011).